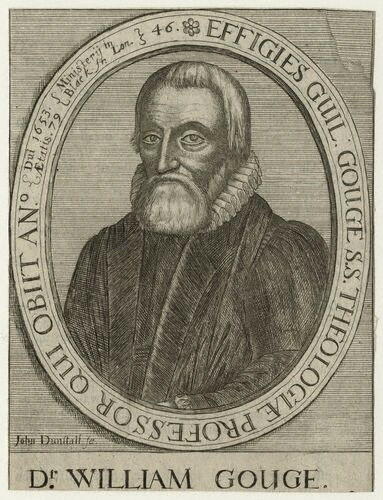 William Gouge (1575–1653) was an English clergyman and author. He was a minister and preacher at St. Ann Blackfriars for 45 years, from 1608, and a member of the Westminster Assembly from 1643. He was born in Stratford-le-Bow, Middlesex, and baptised on 6 November 1575. He was educated at Felsted, St. Paul’s School, Eton College, and King’s College, Cambridge. He graduated B.A. in 1598 and M.A. in 1601. Before moving to London, he was a Fellow and lecturer at Cambridge. He caused a near-riot by his advocacy of Ramism over the traditional methods of Aristotle. At Blackfriars, he was initially assistant to Stephen Egerton (c.1554-1622), taking over as lecturer. He proposed an early dispensational scheme. He took an interest in Sir Henry Finch’s Calling of the Jews, and published it under his own name; this led to a spell of imprisonment in 1621, since the publication displeased James I of England. Based upon thirty years of Wednesday lectures at St. Ann Blackfriars! Includes an eleven page biographical preface. This volume covers Hebrews 1-5. This volume covers Hebrews 6-10. This volume covers Hebrews 11-13. 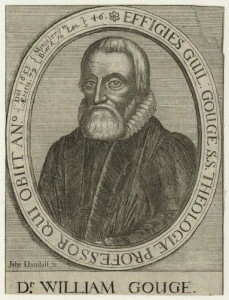 Gouge died before he could complete this volume; his eldest son Thomas completed the commentary on Hebrews 13. Nicely formatted, with embedded Scripture references. A sermon on 2 Chronicles 8:9, preached to the artillery company of London on June 13, 1626. An Exposition on the Fifth of John (John 5) – pdf, 99 pp. An Exposition Upon the Third of John (John 3:29–34) – pdf, 22 pp. An Exposition Upon the First of Mark (Mark 1:25–2:14) – pdf, 43 pp. An Exposition Upon the Third of Luke (Luke 3:19–20) – pdf, 2 pp. An Exposition Upon the Fourth of James (James 4:7) – pdf, 4 pp. An Exposition Upon the Second of Genesis (Genesis 2:9, 7:23) – pdf, 6 pp. An Exposition Upon the Twelfth of Exodus (Exodus 12:8,11,14–16) – pdf, 14 pp. An Exposition Upon the Thirtieth Psalm (Psalm 30:2) – pdf, 3 pp. An Exposition of Ephesians 5:22–33 – pdf, 67 pp. An Exposition of Ephesians 6:4–15 – pdf, 47 pp. God’s Three Arrows: Plague, Famine, Sword – pdf, 398 pp. A Plaster for the Plague (Numbers 16:44-49) – pdf, 140 pp. Dearth’s Death (or, “A Removal of Famine”, 2 Samuel 21:1) – pdf, 55 pp. The Church’s Conquest Over the Sword (Exodus 17:8-16) – pdf, 202 pp. The Extent of God’s Providence (Matthew 10:29-31) – pdf, 35 pp. The Dignity of Chivalry (2 Chronicles 8:9) – pdf, 34 pp. A sermon preached November 17, 1644, celebrating deliverance from Queen Elizabeth’s persecution. Exodus 13:3. A sermon on Ezekiel 36:11. The epub, mobi, and txt files are significantly cleaned up and formatted. A sermon on Luke 15:32. A sermon on Ezra 8:21, preached before Parliament on September 12, 1648. 85 questions and answers about the Sabbath. A commentary on Psalm 116. A sermon preached to Parliament in 1642. The Whole Armour of God (Ephesians 6:10-20) – pdf, 294 pp. A Treatise of Sin Against the Holy Ghost (Matthew 12:31-32; Mark 3:28-29) – pdf, 32 pp. Of Domestical Duties (Ephesians 5:21-6:9) – pdf, 411 pp. The Scriptural Basis for Domestical Duties – pdf, 103 pp. An exposition of Ephesians 5:21-6:9. Of Husband and Wife, mutual duties betwixt man and wife – pdf, 53 pp. Of Wives’ Particular Duties – pdf, 45 pp. Of Husbands’ Particular Duties – pdf, 42 pp. Duties of Children – pdf, 37 pp. Duties of Parents – pdf, 49 pp. Duties of Servants – pdf, 31 pp. Duties of Masters – pdf, 26 pp. Patterns of Prayers for the Several Members of a Family – pdf, 10 pp. Want to discuss something pertaining to William Gouge? Leave a public comment below (subject to moderation), or send a private message to the webmaster.